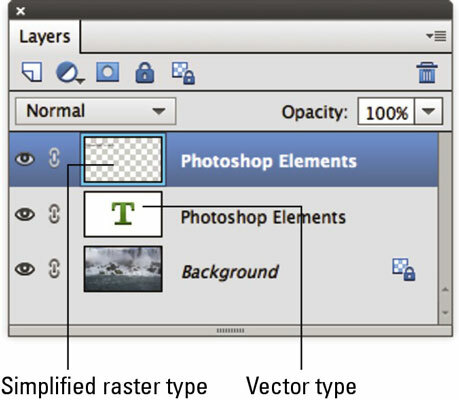 The Type tool in Photoshop Elements 11 creates editable type layers. You can change the wording, spacing, font, font size, and other factors as much as you want as long as the type remains in a type layer, which retains a vector format. However, after you make all the changes you want, you may need to convert your vector type layer to pixels as rasterized type. In Elements, this rasterization process is referred to as simplifying. After the type is simplified, you can apply filters, paint on the type, and apply gradients and patterns. If you’re working with layers and flatten your image (merge layers into a single background image), the type layers are also simplified and merged with the other pixels in the image. By the way, if you try to apply a filter to a vector type layer, Elements barks at you that the type layer must be simplified before continuing and gives you the opportunity to click OK (if you want to simplify) or Cancel. To simplify your type, select the type layer in the Layers panel and choose Layer→Simplify Layer. Your type layer is then converted (the T icon disappears) into a regular layer on which your type is now displayed as pixels against a transparent background. After you simplify your type, you can no longer edit the text, nor can you resize the text without risking jaggies. Simplify your type only when you’re certain that you no longer need to edit or resize it. Another thing to remember about simplified type is that although it looks identical to vector type onscreen, it may not print as crisply and cleanly as vector type. So, if you’re experimenting with painting or filters on type, just make a duplicate of the type layer before simplifying it and then hide that layer in the Layers panel.